Tomorrow morning we are leaving Wales and heading to France!! We are taking a ferry over and then will be in Paris on Monday! I am ready for all the bread, chocolates, and coffee!! The second half of our trip is what I’ve been looking forward to the most. Mostly all the yummy foods we will be eating haha. On March 7th we started our amazing journey across many countries for 2 months. During these 2 months we will be visiting Scotland, Wales, France, Austria, Italy, and London. Scotland was our first stop and we will be leaving here on Monday. So with our trip to Scotland coming to an end I thought I would give you all a little recap of our trip. We started off the trip by visiting the grocery store and shopping around stores. Their grocery stores are a lot smaller here! Most are the size of a convenience store. We also found the cutest outfits for Avery (I posted a photo of them on Instagram). The kids clothes here are too cute! People in Scotland for sure spend most of their money on their kids! All the kids here have the nicest strollers, cutest clothes, and fancy coats! We also went to 2 villages here, Callandar and Edinburg. We visited an old castle in Edinburg. (The old prison there smelled AWFUL!!) The villages are so small and there’s one church in every village. And we visited a gorgeous Catholic Church. We walked around it and of course Avery decided while we were inside of a super quiet church it would be a good idea to scream! Haha thankfully no one was too irritated! We also drank lots of coffee!! The coffee here is amazing! They use different cream and it always looks so pretty! The food here is also very different! They have some of the same things but it all tastes different. The cheese is stronger and most of their things have a hint of cow taste to them. I would not consider the food in Scotland being my favorite food of this trip but the chocolate is really good! Avery has been loving the huge kinder eggs with princesses in the them. Josh has had to work 2 expos while we’ve been here so we’ve been hanging out at the apartment sometimes or walking around the city. It’s pretty cold here and people walk everywhere so we are adjusting to that. 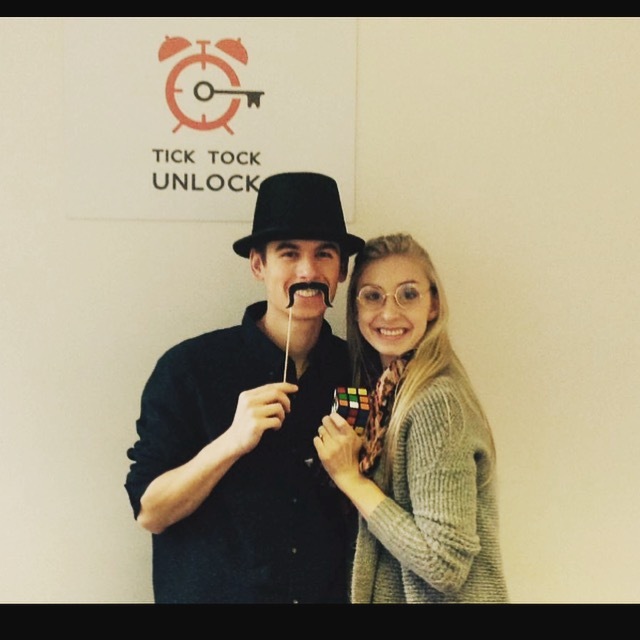 Josh and I were able to get in a date to Tick Tock Unlock which was so much fun! It’s this mystery game where you get locked in a room for 1 hour and you have to use all these clues to unlock different things and eventually use the keys and codes to unlock the door. We got to bring out our inner spies haha. From playing that game I learned that Josh is WAY smarter than I am and that we work great together under pressure! We finished with time to spare and we were in the top 10% of people that finish because it is rare to have a group of 2 finish. We are now ready for our next adventure in a new country! At the end of our time in each country I’ll be posting a recap of that trip. 🙂 Now I am off to enjoy a piece of chocolate! Have a great day! First off I want you to always know and never doubt how much daddy and I love you. We think you are the most amazing daughter in the world and you will always be our sweet baby girl! 2 years ago you made two 17 year olds parents and changed our lives forever. We were scared that we would mess up and not do things right for you but we quickly caught on to parenthood. We knew that as long as we always put your needs above ours and loved you no matter what that we would be just fine. We’ve kept with that attitude your whole life and I think you are turning out pretty great! You are THE MOST important person to us! With you being 2 I wanted you to be able to read this letter and know what kind of toddler you were like. For starters you have the best sense of humor. You get that from your daddy! You say things in a really high voice and then a really low voice. And you love scaring people and wanting them to scream. You love running around the house being chased. Your favorite toys right now are the bubble guppies bath toys, Mickey Mouse and friends, Nemo and friends, and all your little people. You like putting your toys in time out and calling them “bad boys”. Only daddy can pick your pjs out and it’s a nightly routine that he makes fun and silly. You go almost everywhere with me. I hate driving in the car and not having you to talk to so I just take you wherever I go! You also love talking to people! Whenever we go we get multiple people saying how cute you are and you love smiling at them and saying thank you. Your favorite colors are blue and green. Your favorite foods are tacos, yogurt, toast, Mac and cheese, pears, avocados, fish and anything chocolate. If we even say the words chocolate or m&m’s you freak out and get so excited. You love facial expressions! I can usually tell your mood by the face you are making. You repeat anything and everything we say now. You talk all day long! It’s cute to hear you get your thoughts out and hear your feelings. If you are happy, sad, excited or mad you let the world know! You are so honest, I love it! You say exactly what you feel and if you are feeling a little moody you come cuddle in my arms until you feel better. You randoming come up to me and say “momma hug!” And squeeze me tight! You have no clue but my heart melts inside! We have lots of fun moments together! You also like playing with mommy’s make up brushes while I get ready. Your favorite thing to do with make up is take my thin eyeshadow brushes and sweep them over my eyebrows. You have a great imagination and could play with our stuff for hours! And ever since my birthday you’ve been singing happy birthday to yourself and have been getting so excited for today! We’ve had a lot of fun every day with you. You bring so much joy I go our lives! Mommy prays for you every day! I pray every day for your well being, that you’ll always put God first, and that you’ll continue to keep the glow that’s inside of you. I try every day to set an example for you of what a good mom and wife should look like. You make me a better person! Mommy and daddy love you more than you’ll ever be able to understand. You have brought us more happiness in 2 years than we’ve had in our entire life. In mommy and daddy’s vows we both said “Every day is better because of you”. We feel that way about you too! The amount of love and kindness you have in your heart is overflowing! 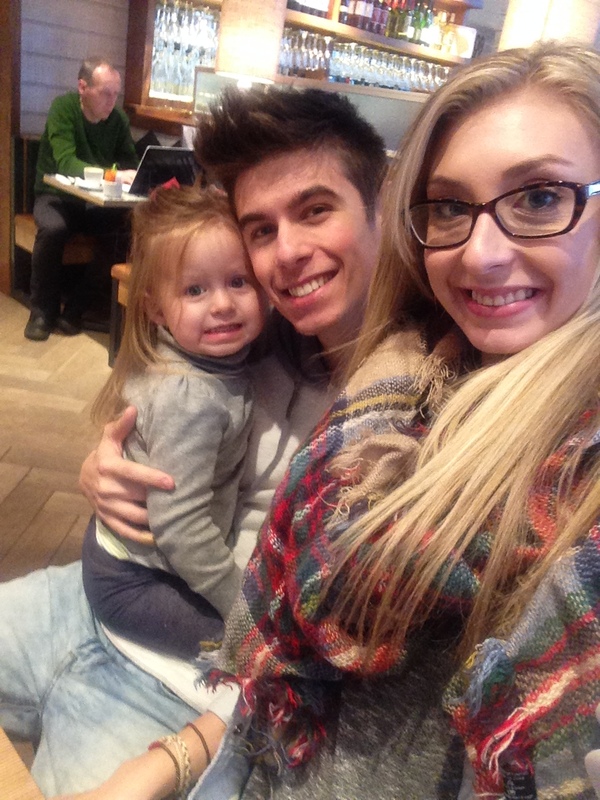 You are the most extraordinary 2 year old in the world! I love watching you become smarter and grow every single day. Thank you for being 100% you Avery Gracie! Mommy and daddy absolutely love being your parents!